I have fished in New Zealand for many years, and one thing I never want to miss whenever I am there is an opportunity to fish with Ian Cole. I have been to numerous rivers and lakes with Ian with great success. Besides being an extremely competent and hard-working guide with amazing fish spotting skills and thorough local knowledge, Ian is great company with a great sense of humour who will make your trip all the more fun! Overseas anglers need to be in good hands in New Zealand and fishing with Ian ensures you that. In my 25 years of fly fishing I have been lucky enough to enjoy some of the best fly fishing in the world - England chalk streams, Scotland, Alaska, Iceland, Norway, Tasmania, the Snowy Mountains, South America. However it does not come any better than South Island NZ with Ian Cole as your guide. Exceptional fishing and great spotting are a given with Ian. It is his genuine desire to want you to get the most out of the day, to improve your fishing and just have a good time that sets him apart. He is a great coach and great company which is why I have already clocked up 25 days guided fishing with him and plan many more. Ian has extensively guided over the lower half of the South Island since 1992. Starting fly fishing at the tender age of 13 he has amassed 45 years of fly-fishing experience and this, coupled with in-depth local knowledge and expert spotting ability, all contribute to the very best in fly-fishing experiences and resulting successes. Ian is an enthusiastic, patient and encouraging guide. He adds a little humour to the whole “serious fun business.” He prides himself on his ability to continually “up skill” his clients - both novice and expert alike. He has keen trout spotting abilities and extensive knowledge and understanding of all aspects of the fly-fishing from casting and presentation techniques to entomology and fly-tying. 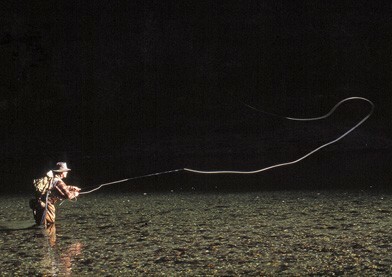 provide and maximise the ultimate in New Zealand fly-fishing experience and make your stay both memorable and enjoyable. Federation of Flyfishers' Certified Casting Instructor, Ian has hosted a number of successful fly-casting schools as well as written articles for magazines. Over the years, he has featured in a number of videos and written publications. His dedication to the resource has seen him enjoy a long history in fisheries management. Wanaka, the base for Ian's guiding service is nestled deep in the heart of the Southern Alps of the South Island. 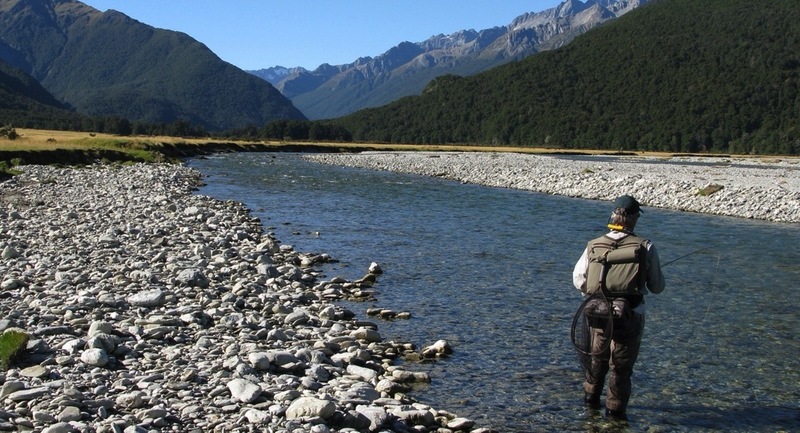 Often referred to as the jewel in the South Island's crown, it offers an exciting array of angler opportunities as well as extensively catering for nonfishing activities. The region offers an impressive diversity of angling opportunities to the visiting flyfisher. Set in truly magnificent scenery the area boasts a number of quality rivers and streams together with a host of major lakes and still-waters, all great habitats for both brown andr ainbow trout. 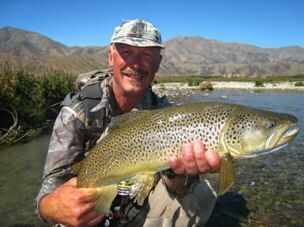 Although the vast majority of Ian's guiding is sight fishing on rivers and streams he has, over the years, introduced many to the delights of sight-fishing the clear waters of the region's many still-waters. Stalking the shallows for cruising browns is most challenging - requiring stealth and careful fly presentation. Many have likened it to a more diverse form of bonefishing. Ian is a fly-fisher's guide. All trips are personally serviced by him. Having previously owned and operated a leading café in Wanaka for 16 years his guiding service reflects his commitment to warm friendly professional service. So whether you are contemplating a full 1, 2 or 3 days guiding or a multiday tour of the south let Ian maximise your angling opportunity and experiences by sharing with you some of the finest sight fishing to trout in the world.